Imagine living during a time when pirates ruled the high seas— battling enemy ships, plundering treasure and avoiding Davy Jones's Locker. Last summer, a group of two faculty and 10 students worked together to develop a game in ComArtSci’s Games for Entertainment and Learning (GEL) Lab to bring this idea to life. The result was Plunder Panic, a multiplayer arcade game based on the swashbuckling lives of pirates. 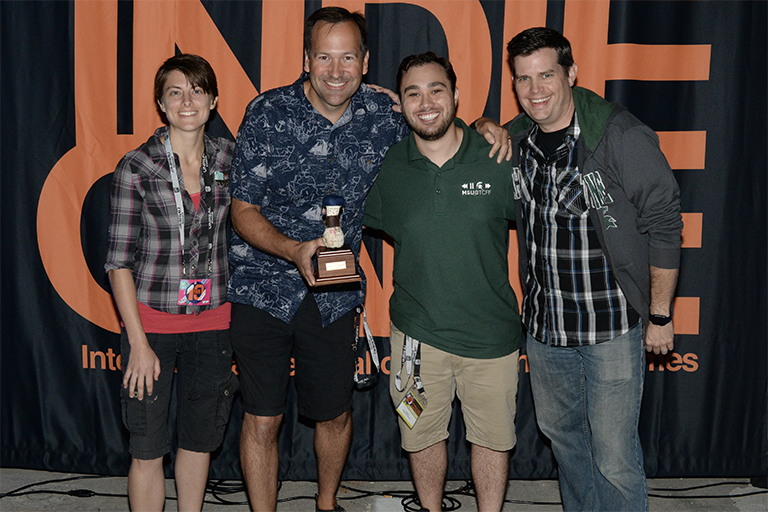 Despite a small budget and a major time crunch, the game debuted at the Traverse City Film Festival (TCFF) in July and won the Audience Choice Award at IndieCade last week. Jeremy Gibson Bond, a professor of practice in the Department of Media and Information, has served as IndieCade’s Chair of Education and Advancement for four years and was responsible for encouraging MSU’s sponsorship of IndieCade. Plunder Panic was inspired in part by nostalgia— nothing quite compares to the simple joy of spending a Saturday playing video games with friends. Jerod Pennington, a Media and Information senior who served as a designer for the game, believes it was a smash hit with the audience because of its easy-to-understand concept and simple, two-button controller that resembles an old Nintendo controller. He said the pixel-style art was another reason, because it was reminiscent of console and arcade games from the late 80s and early 90s, which served to pull in a broader audience. The performance of games at festivals like IndieCade impact rankings for the Princeton Review, where MSU placed 10th in the world and number one in the Big Ten last year. Bond believes Plunder Panic’s win will have a positive effect on rankings and pay dividends to the school for years to come. While the GEL Lab often focuses on creating educational games, Plunder Panic was a chance to show off faculty and students’ talent in creating a game that was simply for entertainment. Jeffery hopes that the award at IndieCade will lead to more recognition for work that comes out of the GEL Lab. According to Pennington, minoring in game design is often quite challenging because it utilizes project-based learning and quick deadlines, forcing students to work together and put in the time. According to Jeffery, this is only the first stop on Plunder Panic’s voyage.